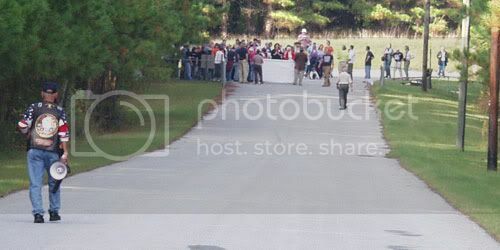 This event was the latest of many identical events staged by the local leftists of North Carolina. 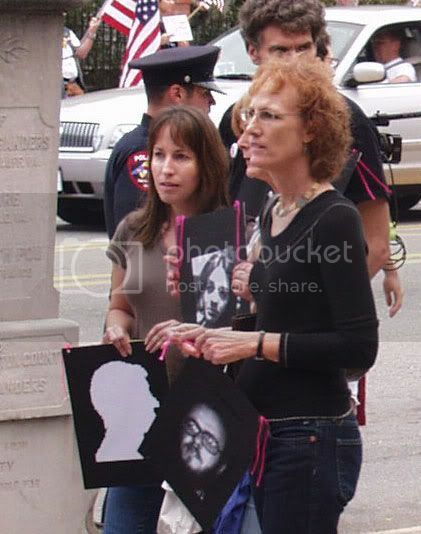 On several occasions in the past, this same batch of Moonbats has clogged the streets and sidewalks of Smithfield to present their anti-America, anti-military, Bush bashing carnival. On each of these occasions, they have climaxed their treason-fest by trespassing on Aero Contractor property and indulging in ‘peaceful’ vandalism. 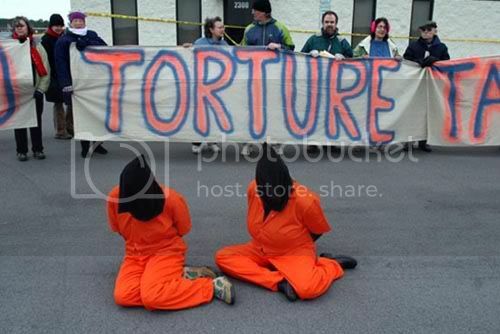 1 – We resolved to disallow another unopposed demonstration of loathing for America. 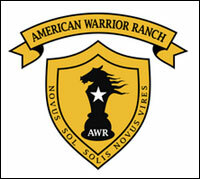 2 – We resolved that no moonbat would enter onto Aero Contractors property. I am pleased to report that this mission was a success. 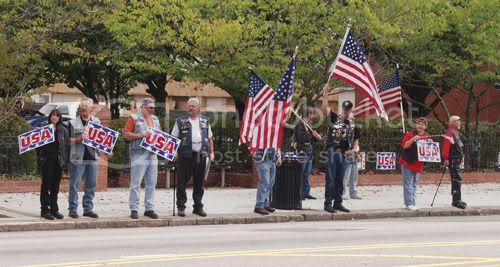 Starting 2 or 3 hours before the moonbats began their hissy fit, Eagles lined the streets and provided a patriotic presence in Smithfield. 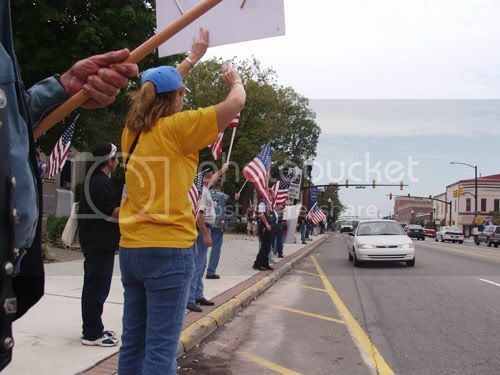 The reaction of the people of Smithfield was one of appreciation and solidarity, as expressed by the constant sound of car horns, waves and shouts of approval. 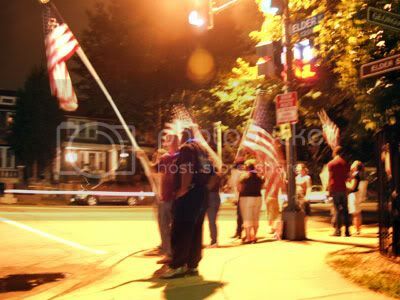 Eagles representing several chapters of Rolling Thunder took a position on Main Street. 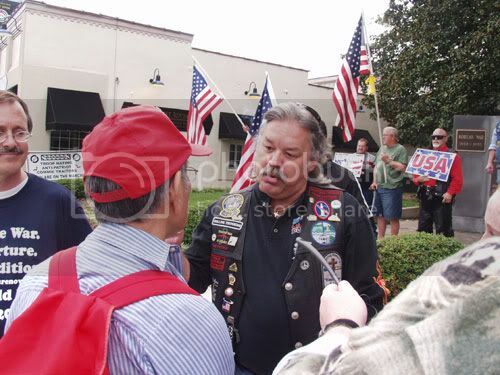 Uncle George Samek carrying the Eagle’s message to the dark sides of the streets. The locals are entertained. Eagles attempted to engage in logical dialog with moonbats. Good luck with that, Bart. 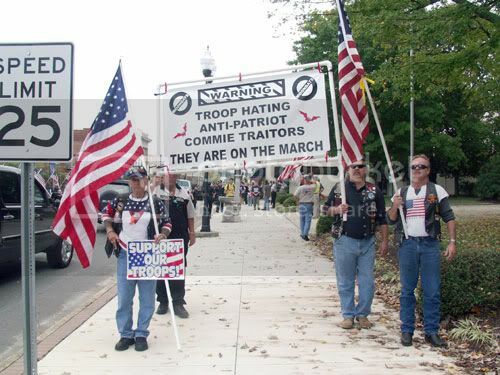 The Moonbat Parade was preceded by Eagles as a courtesy ‘heads up’ to the general public. Remember that I used the word ‘freakshow’ above? 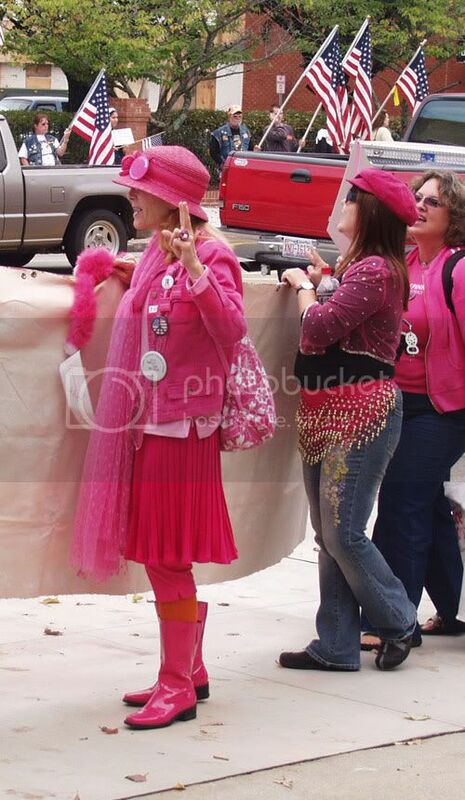 Below: Wornout 60’s hippies trying to relive the glory daze. 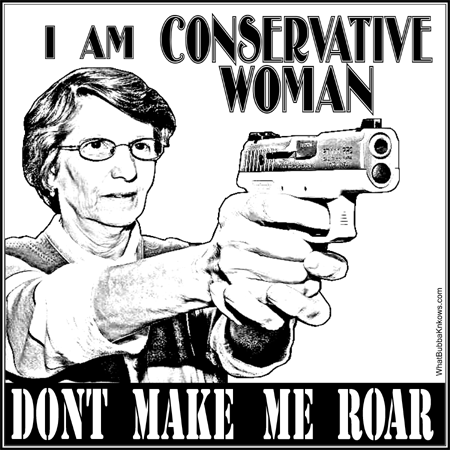 Any Viet Vets out there remember being spit on by this granny? 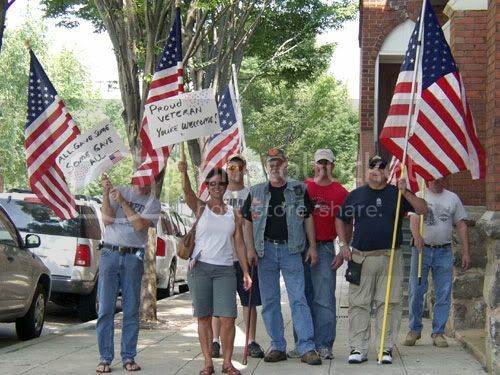 After the moonbat parade settled into the Town Commons and began their America bash, the Eagles formed up behind them. We were not quiet. A shot of the Town Commons. Notice the total lack of American flags. They dont even have one on the stage. … but the bridge is manned by Eagles. Eagles gathered at the entrance to Aero Contractors … minutes ahead of a flood of moonbats. For reference, here’s some photos of previous moonbat attacks on Aero Contractors. These photos were taken by the moonbats, and depict their trespassing and vandalism of private property. Several of them were arrested. On October 27 2007, the would-be vandals found this waiting for them at the gates. 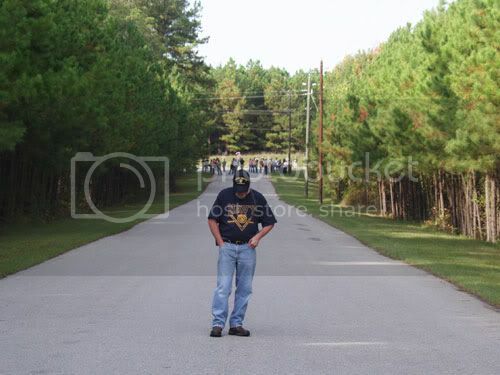 Raleigh Eagle Mike Medlin stands with his back to the moonbats. At this point, we’ve waited almost an hour for them to finish their meditation (not joking) and muster the courage to come on down. Moonbat trying to comprehend opposition. 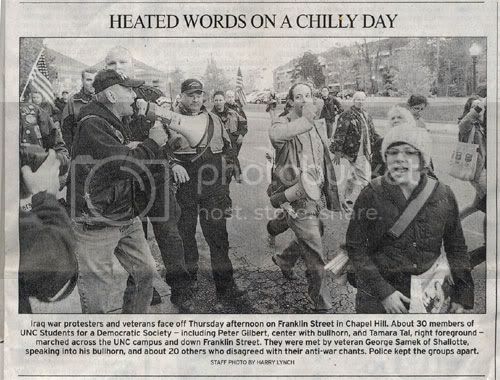 His free speech has always been unoppossed. He doesnt understand that his opinion is his only. And he’s wondering what the heck he’s gonna do with that sign now. After a long wait, some Eagles get impatient. But, finally, they came. 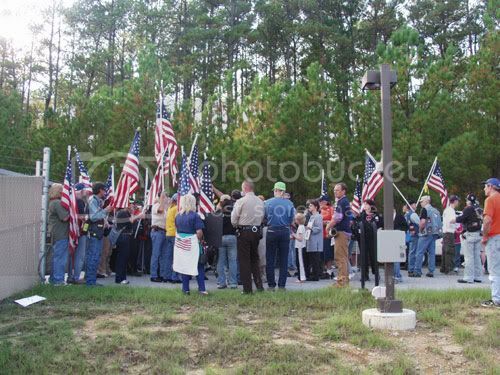 Patriots and moonbats mingled at the gate. In the end, The Eagles remained at the uncrossed fence. I thank and appreciate the efforts of all who yesterday yesterday, and those that couldnt physically be there but supported and helped. 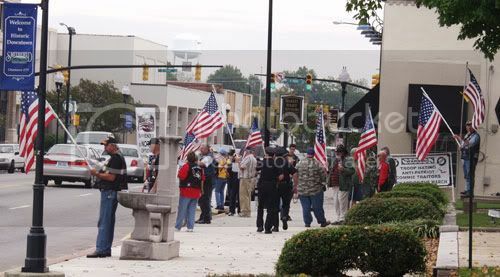 Smithfield was but one front of the battle of October 27, 2007. 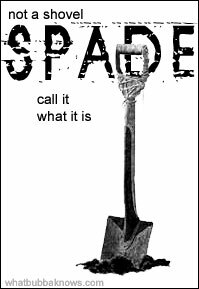 All across the USA, the Home Insurgency planned attacks in multiple cities. Most of them were opposed by the Gathering of Eagles. I know that some have questions as to why we allowed the moonbats to even get close to the fence. The reason is this: the Johnston County Sheriff Deputies asked us to do so. We will never give law enforcement a reason to dread our presence. 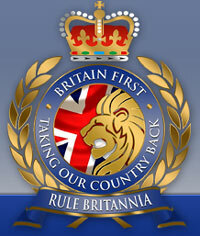 Remember that those same moonbats stormed Aero property, on several occasions, and successfully vandalised it. Though some of them were arrested, they still accomplished their goal. And they did it unopposed. What we did yesterday changed that. 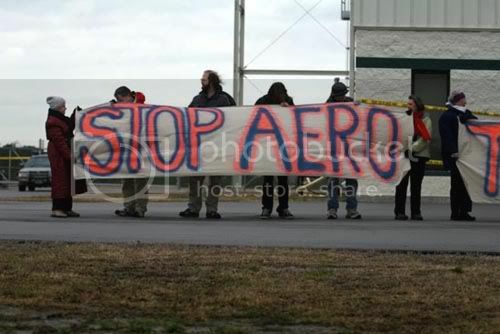 They did not get onto Aero property. They were stalled at the highway for over an hour, by a smaller group. Had the Eagles not been there, could they have crossed the gate and did what they did before? 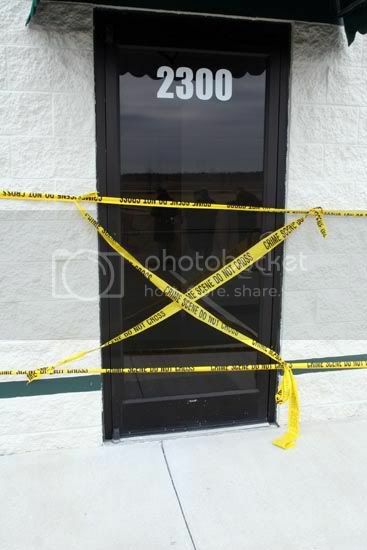 Once again remember that they did it with expectations of arrest – meaning the 3 deputies that were there in the beginning could not have stopped them from entering Aero property. Our presence alone is what prevented their repeat of previous success. The Eagles closed the day with the usual pledge. An incredible day and a “WIN” for the Eagles! 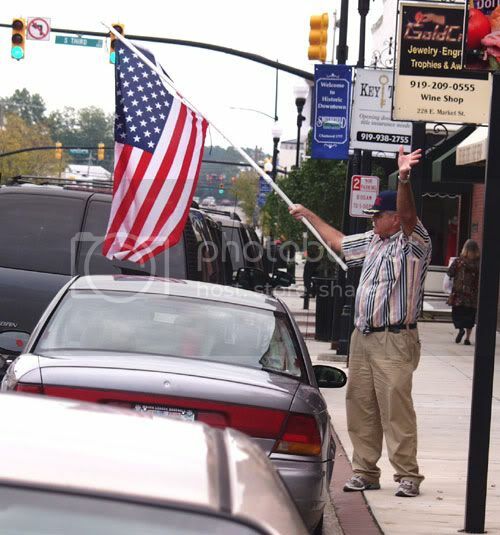 Airborne Gunny (Larry) & One Patriotic Wife (Lori) headed out this morning for Smithfield, NC. 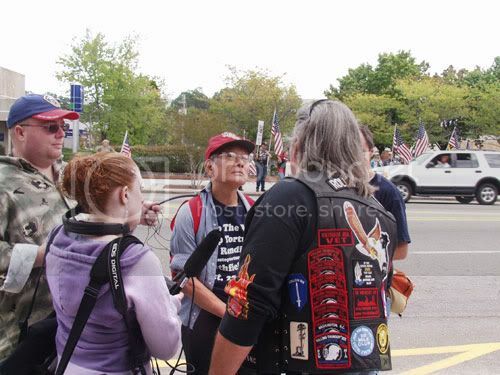 We met with Bubba (GOE NC Coordinator), his wife Donna and many other Eagles in a parking lot behind the courthouse to prepare for the Moonbats scheduled 3 events of the day. 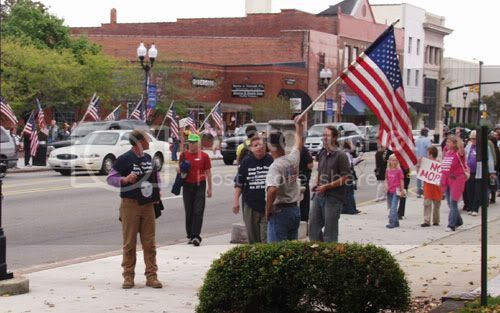 The first was a scheduled march down main street of town. We gathered on the avenue at HIGH NOON! 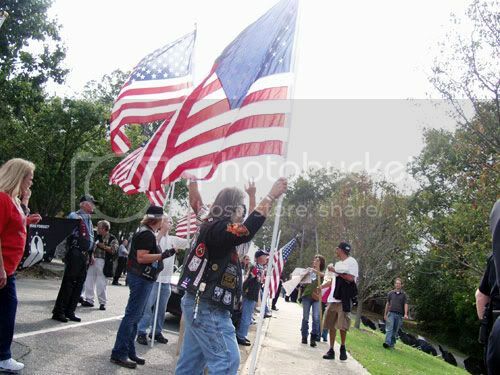 Standing amongst GOE, Rolling Thunder, Eagles Up and other Patriotic Americans. 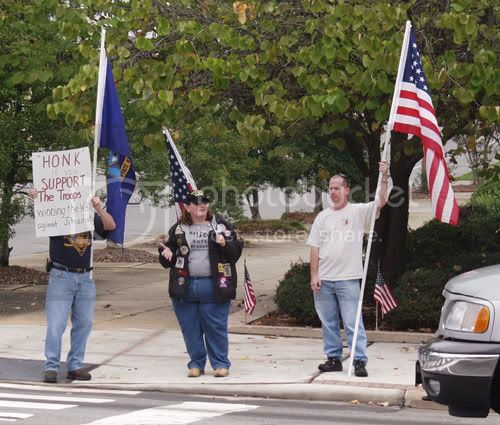 As usual the kick off of their “Pinko” Parade did not go off as their announced time, but the enthusiasm of passer bys with honks of Support of the Troops as we stood with our Flags, Signs and many hand made signs rallied all of us. The pre-parade tension was met with the local police requesting that we either stand on the opposite side of the street or on the grass, away from their so – called parade route down the sidewalk. To say that the tension could have been cut with a knife would be an understatement. So, as good Eagles would do, we took both sides of the street! We have Rights Too. Now heading for the Park area (Event 2), Bubba and his wife Donna already had a plan in place. 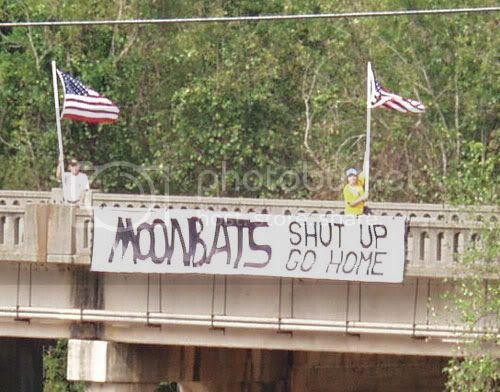 They had a banner that was hung on the overpass facing the Moonbat Rally, and what a Great Statement……….simple and to the point – “MOONBATS SHUT UP AND GO HOME!” This overpass was over a small water way, to which we were graced with 2 Fellow Patriotic Americans in an Air Boat making continuous passes and 360’s with their fan at full blast! 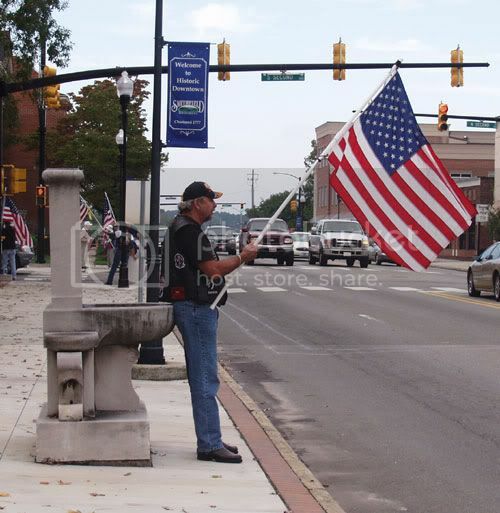 Water spraying the grassy area and the loud noise drowning out the Moonbat Speakers………What a sight! Local police were seen running down to the banks of the river trying to get the boaters attention. How ridiculous! We were hoping that one would just happen to slip in… The boater continued one last pass and then blasted off into the sunset – just like the………. …………………..LONE RANGER! Thank you Kemosabi! Not only did we have the sign on the bridge…. 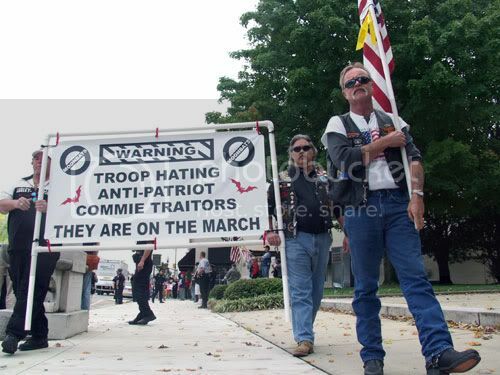 but at the entrance way into the park, another sign was posted (the actual wording slips my mind at this time but the gist was) “ANTI-AMERICA HATE RALLY” being held Today…… Don’t let them get away with this…Show your Support of the TROOPS and Honk to show your Support! Airborne Gunny, One Patriotic Wife, Captain Larry Bailey (Chairman of GOE) and Eagles manned the bridge, while others stood at the entrance corner with Pro American Signs and Flags! Just before 3pm we were off to our 3rd and last event – the Airport. 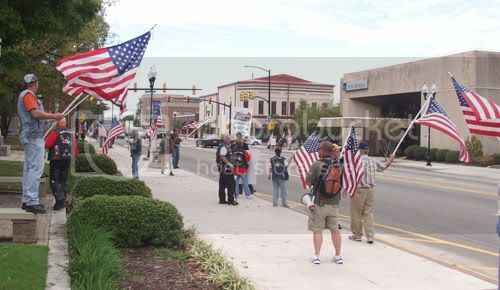 In a previous year, this same group or groups of Anti American Assholes stormed the gates, with no one to challenge them. They were in for a rude awakening this time! 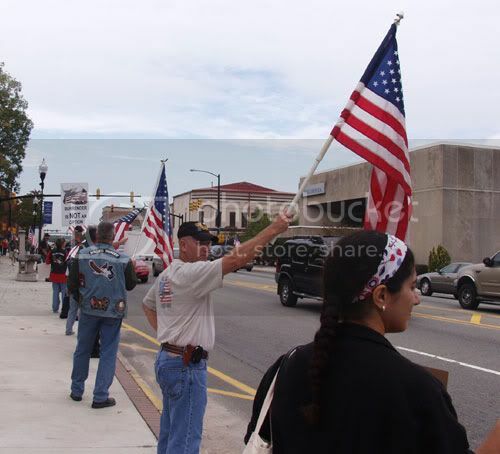 We Eagles were down at the entrance to the tarmac before them, American Flags in hand, shoulder to shoulder, preparing a gauntlet of proud Americans ready to “Stand Our Ground” and get in their faces! In our favor was Sheriff and Deputies that were also ready for Moonbats to overstep their boundaries. 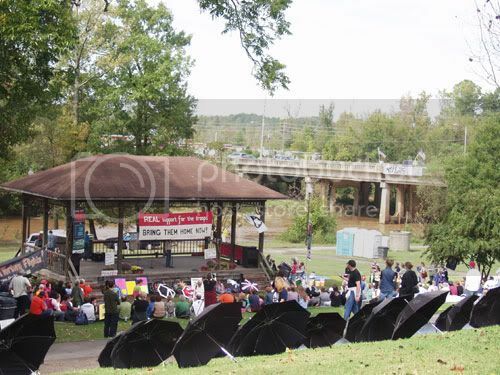 We were in full force! 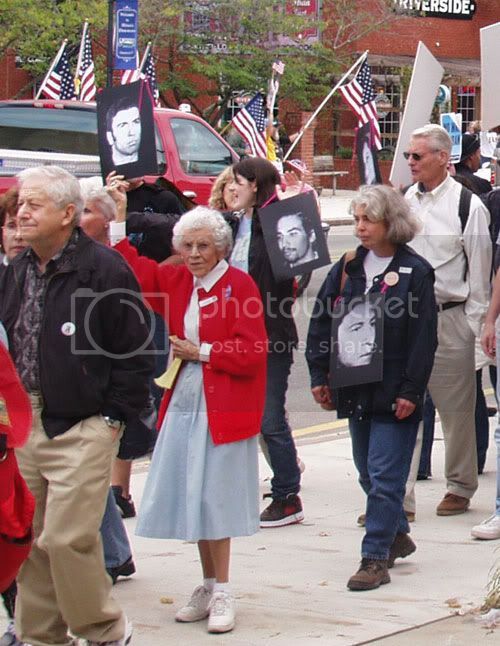 Many of us walked the length of the street as they gathered at the main entrance shouting them down. 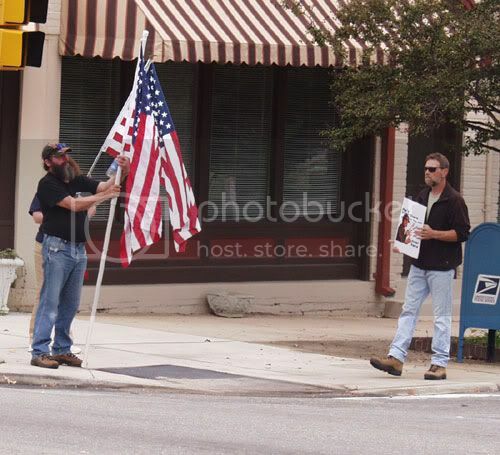 With Speakers in hand, George and Bubba cut them NO SLACK! We let them know we were prepared for them! 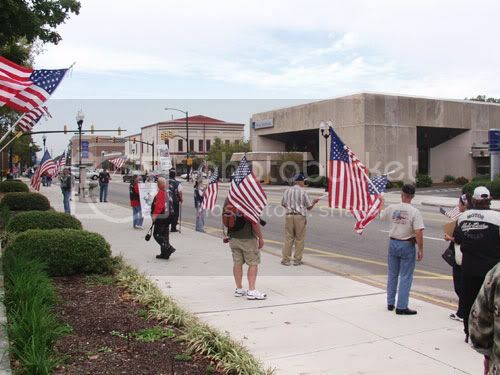 As they began the march down the street, some of the Eagles took the lead! Our colors flying, with whistles blowing (One Patriotic Wife and Donna blew the sound of our Battle Cry) as the Moonbats chanted some inaudible “We are all One”. 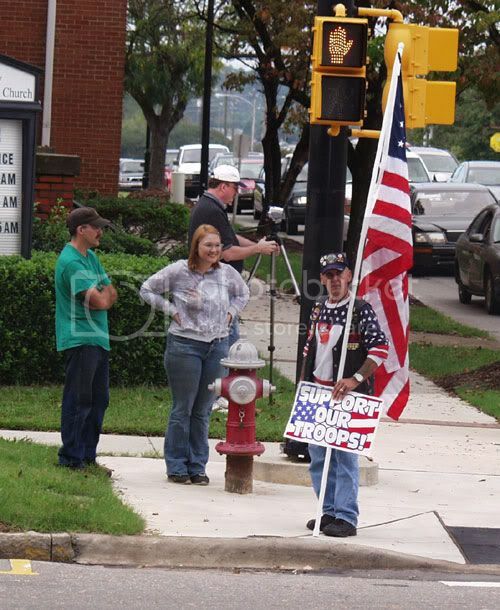 There was also a Patriotic Mom, whose son is in the Navy, made her presence known with the Blasting of an Air Horn! We were asked politely by the Sheriff (Captain in Charge) to let the demonstrators walk through us to the Gate Entrance so they can hang their so-called rally photos on the public side of the fence. At first we were extremely upset that this type of anti- propaganda postings, but as the Captain explained, if anything should fall or be hung over the opposite side, they would be removed and arrested. What some of the Eagles knew but not all at that time, was on the other side waiting for the “Moonbats” if they crashed the gates, were heavily Armed Police in Riot Gear. However, as stupid as the Moonbats are, they weren’t going to try it this time. Gee, how we all wished they had! 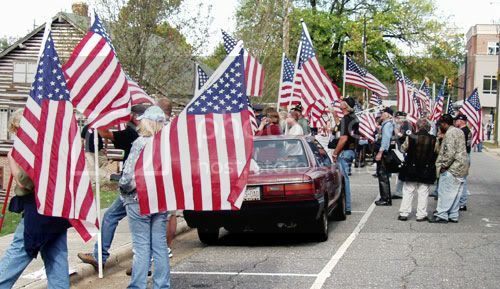 Now at the gate, as we stood our ground, Rolling Thunder setting the back drop with the rest of the Eagles, so as not to give them easy access to the gate, creating a barrier of Pride and Patriotism that could not be breached. Both groups were found intermingled, shouting and confronting each other – toe to toe – nose to nose. 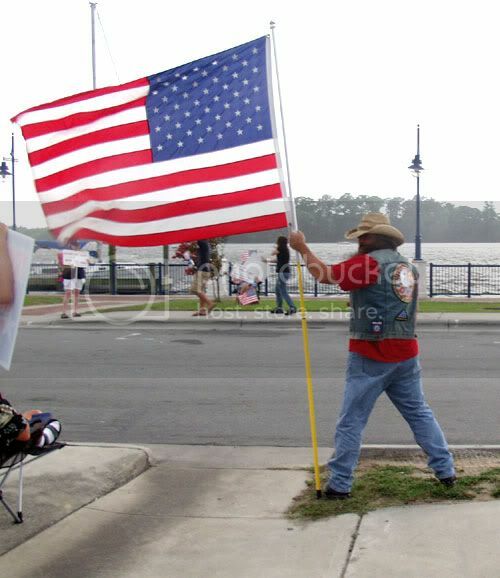 At one point Waldo Pepper, (Thank God for the Cavalry) aided One Patriotic Wife as a demonstrator kept shoving a poster in her face! Swiftly he removed the obstacle and confronted the Moonbat with zeal. 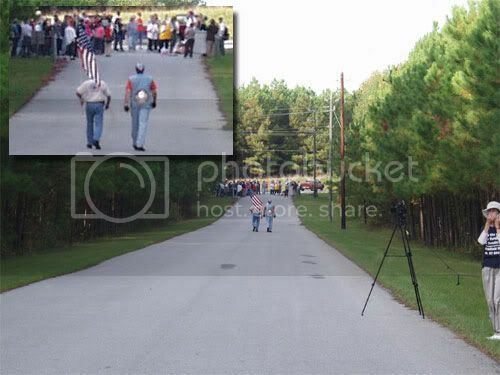 Waldo Pepper, like so many Patriotic Eagles that day, showed there true colors and what it means to “Stand Up For America” We all stood our posts of protecting the gate as these protestors pursued to gain ground. 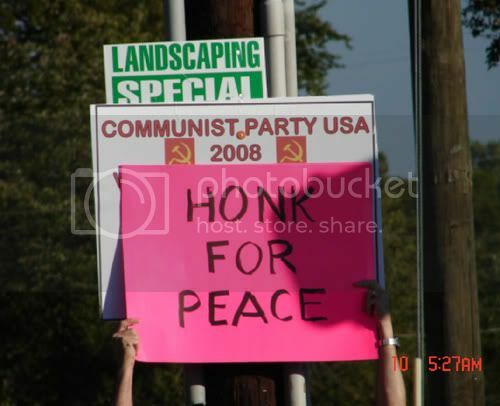 As requested by the Sheriff, we reluctantly allowed the Moonbats to hang their Anti-Propaganda photos on the fence but not without continued confrontation. We did however before we all left, made sure they (Moonbats) removed all their TRASH that was hung. 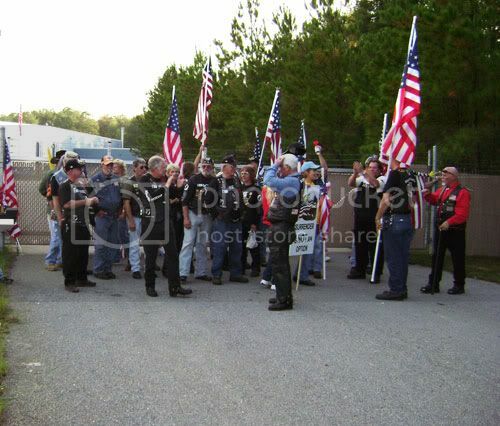 As the Moonbats turned and retreated, Eagles joined in song, singing God Bless America. 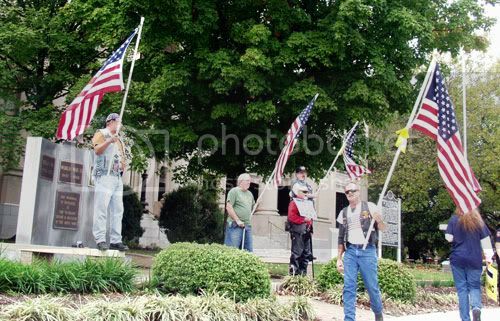 We ended with facing the tallest American Flag held by an Active Duty Soldier, and also a Rolling Thunder Member, who just recently returned from Iraq and said the Pledge of Allegiance. 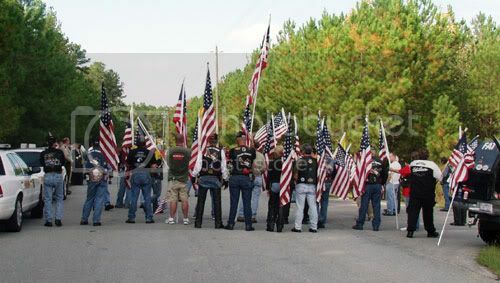 We flanked both sides of the street with American Flags in hand and proudly gave a Hand Salute to both Rolling Thunder Members and the Sheriff Department as they departed. Just a note of Merit to Ross “Bubba” McDowell, Donna and all the Eagles, for the fine job they did in organizing this counter event. MISSION ACCOMPLISHED IN SMITHFIELD, NC. October 27th, 2007 under Uncategorized.